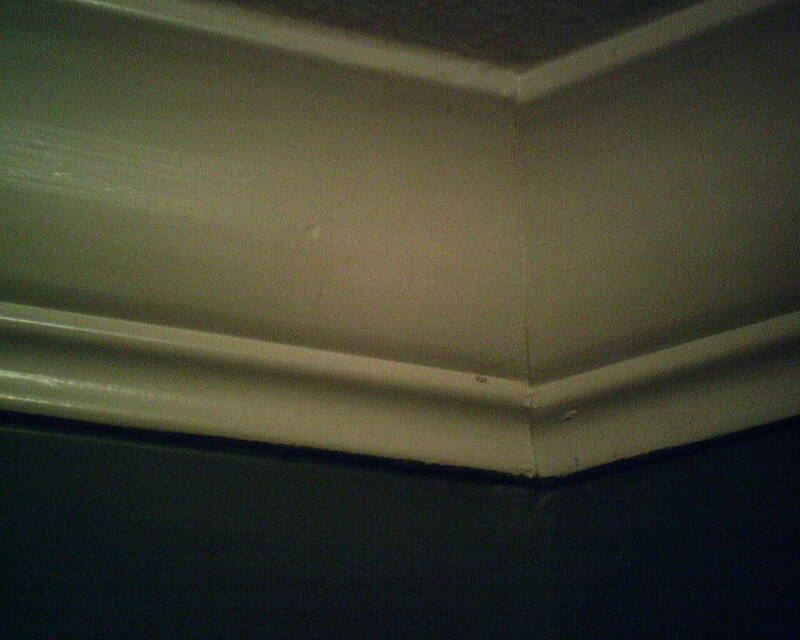 First photo – you are looking at a very close view of crown molding. 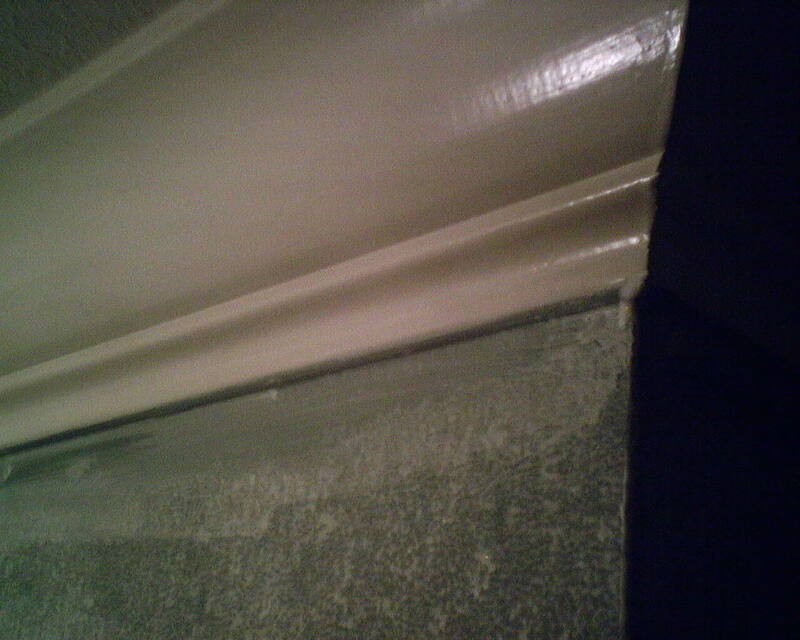 Note that the bottom edge of the molding is painted dark green, the same color as the walls. 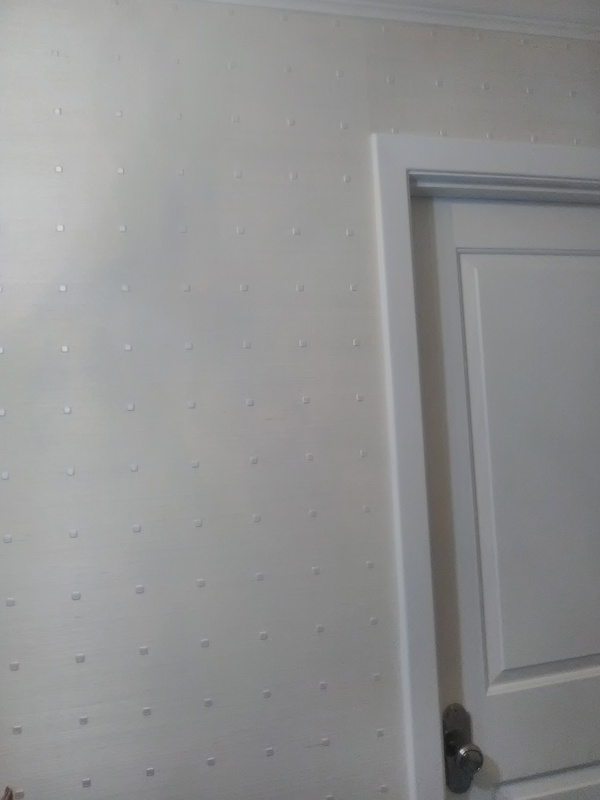 This bottom edge is supposed to be the same color as the rest of the molding. 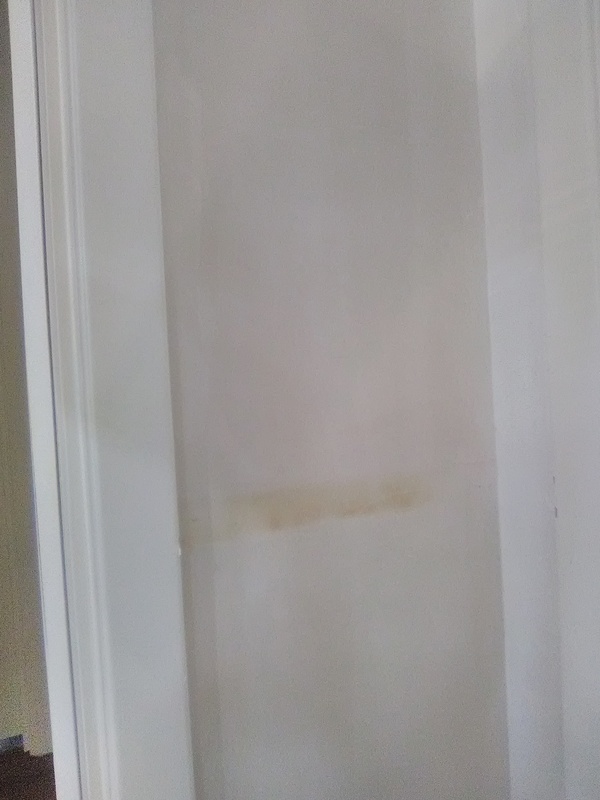 In the second photo, I have brushed my primer on the wall, and so you can see more clearly the dark paint on the bottom of the molding. 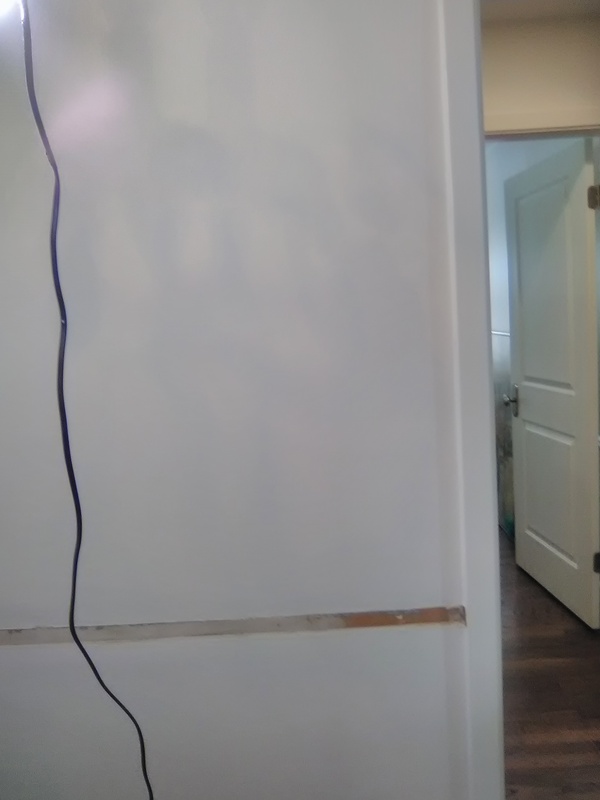 Some painters are too lazy (or unskilled) to cut a neat line along corners and the join points of walls and moldings. 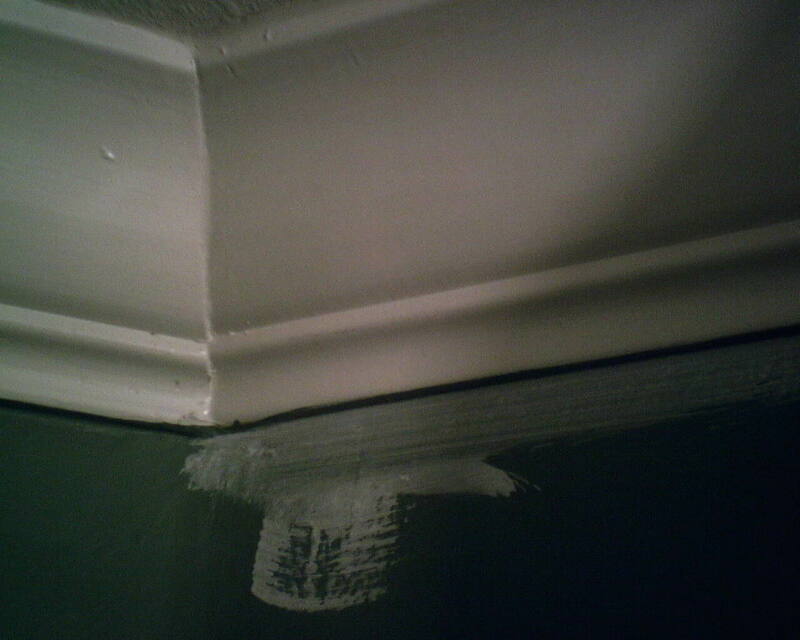 So they often let their paint brush just swipe the bottom edge of the crown molding. 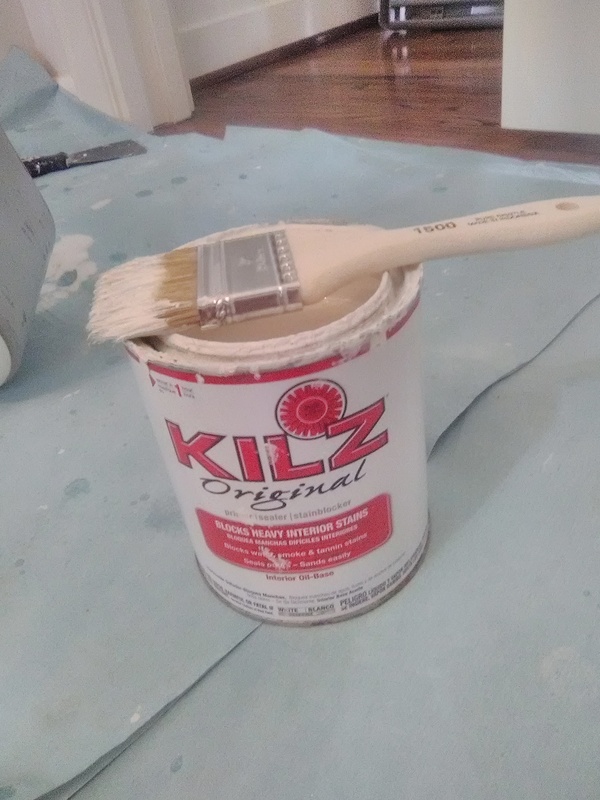 It’s easier and faster than taking the time to tape off the molding, and it takes much less skill than carefully manipulating the brush to paint the wall, and not the molding. 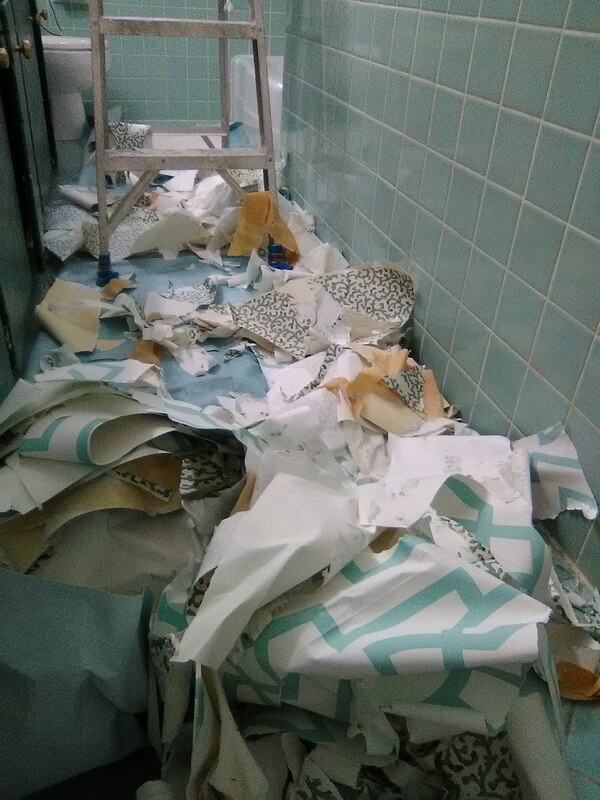 This is a shame, and I hate to see it. 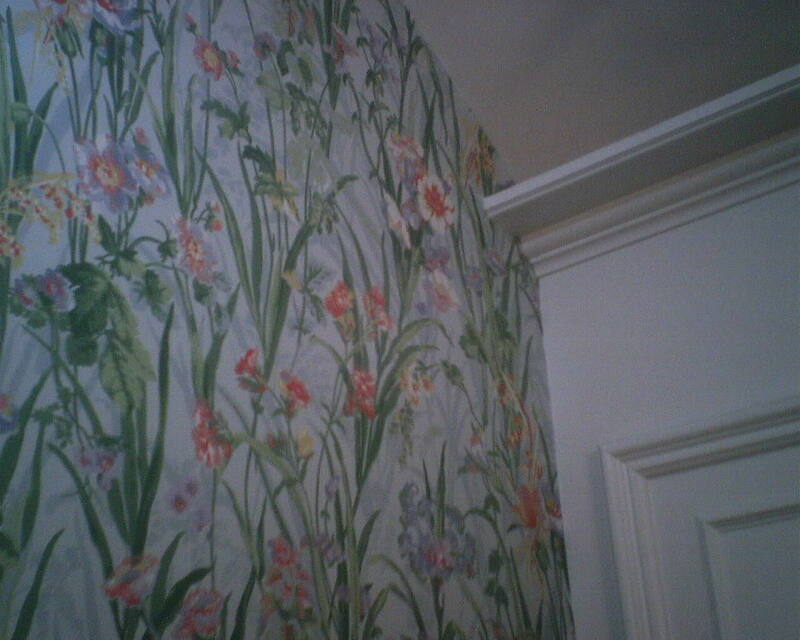 To me, pretty moldings are one of the most classy elements in a home. 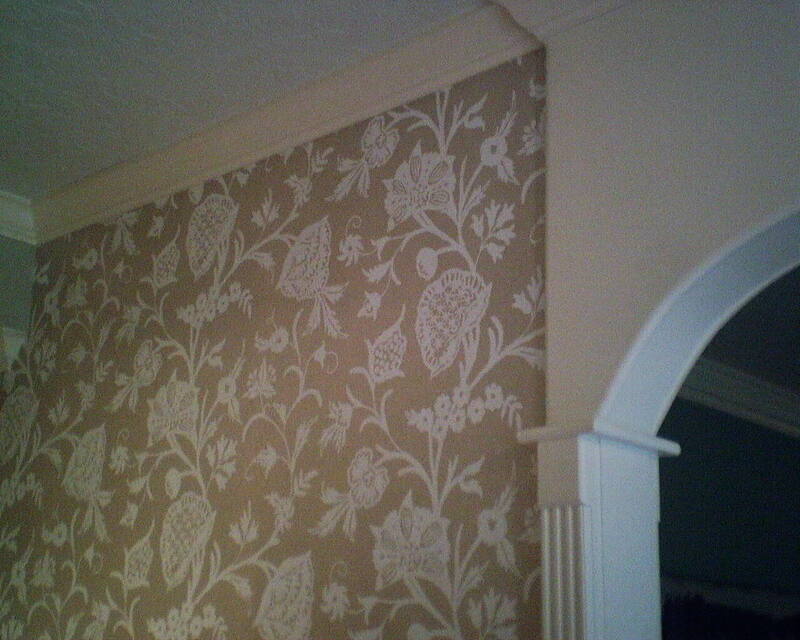 Putting the wall color on the under edge of the crown molding sure does a lot to ruin the effect of the nice molding. 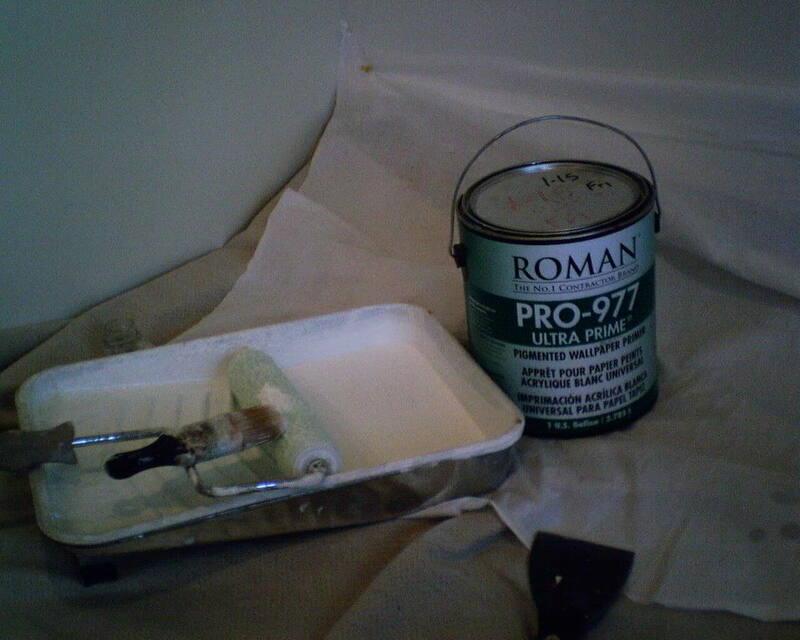 The primer I am using (Roman’s Ultra Prime Pro 977) is white, and in the third photo you can see that I have tried to cover some of the dark green paint. 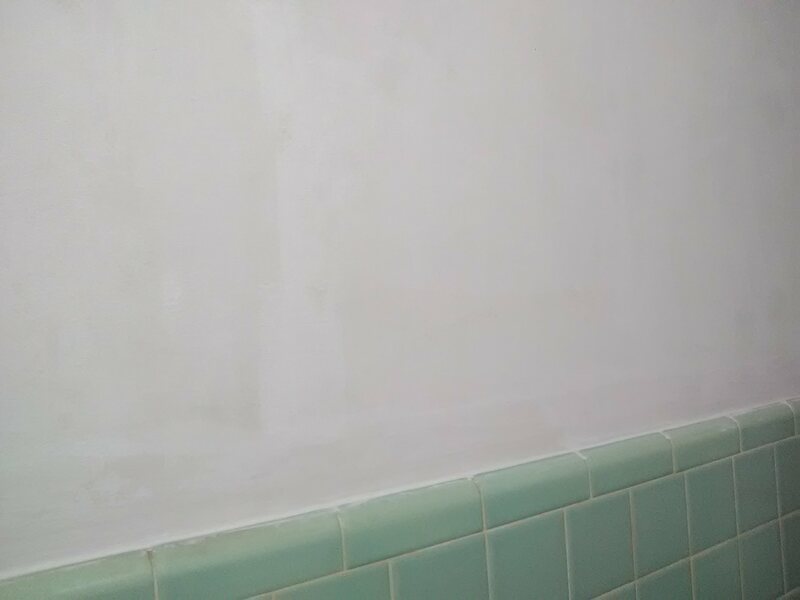 My primer is not paint, though, so, while it helps, it does not cover well. 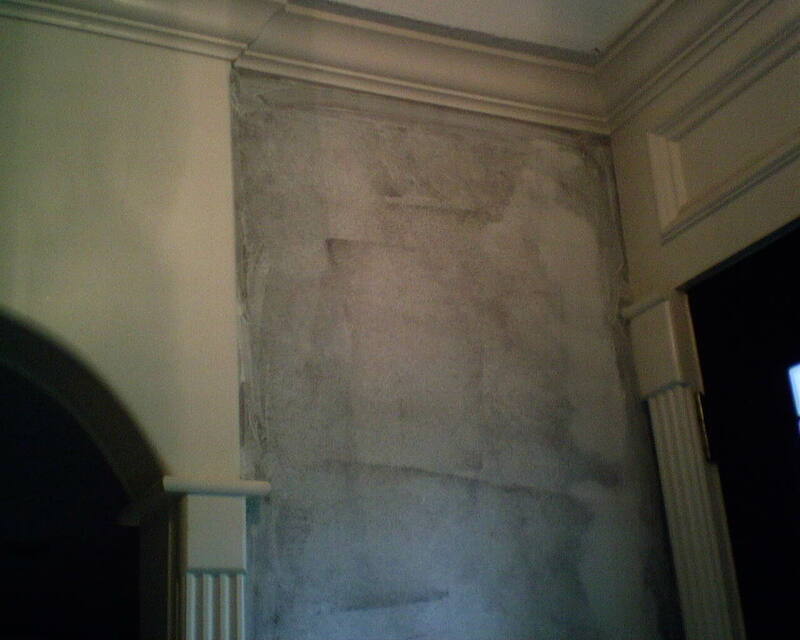 The green paint is still visible, and looks something like a ghost hovering in between my silver and white wallpaper and the white crown molding. 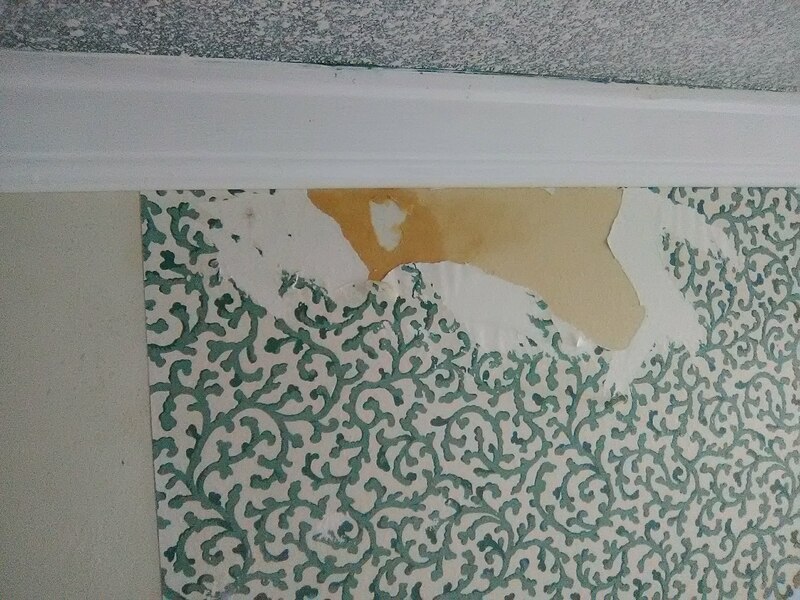 I forgot my camera yesterday, the day I stripped off the old paper and prepped the walls, so I cannot show you the 15 year-old wallpaper with its curling seams, due to 1.) 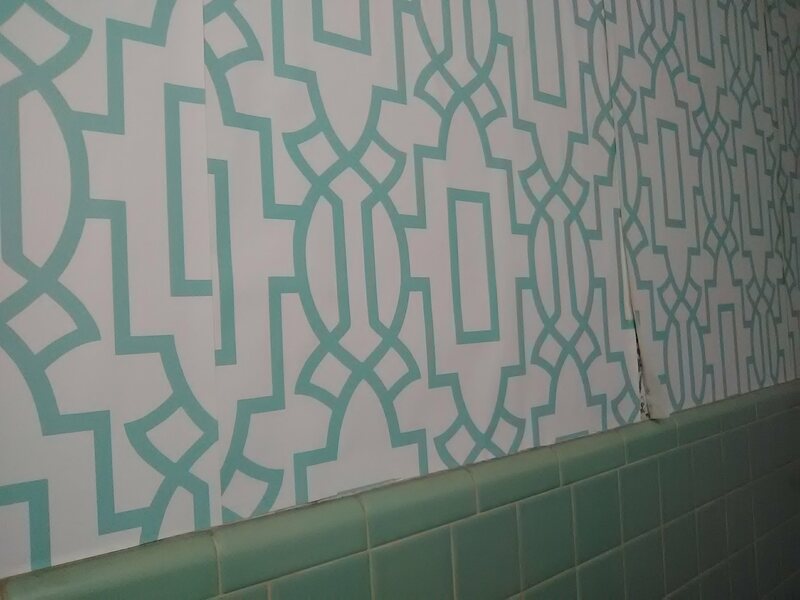 being an inexpensive paper-backed solid vinyl wallpaper (my least favorite kind – do a Search here), and 2.) 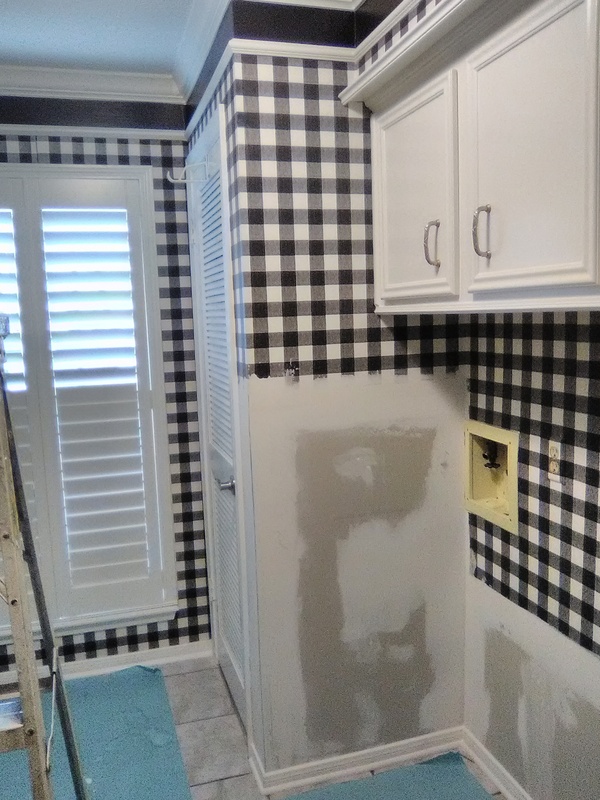 the previous installer did not prime the walls but instead hung the wallpaper directly on the new home’s bare Sheetrock, and 3.) 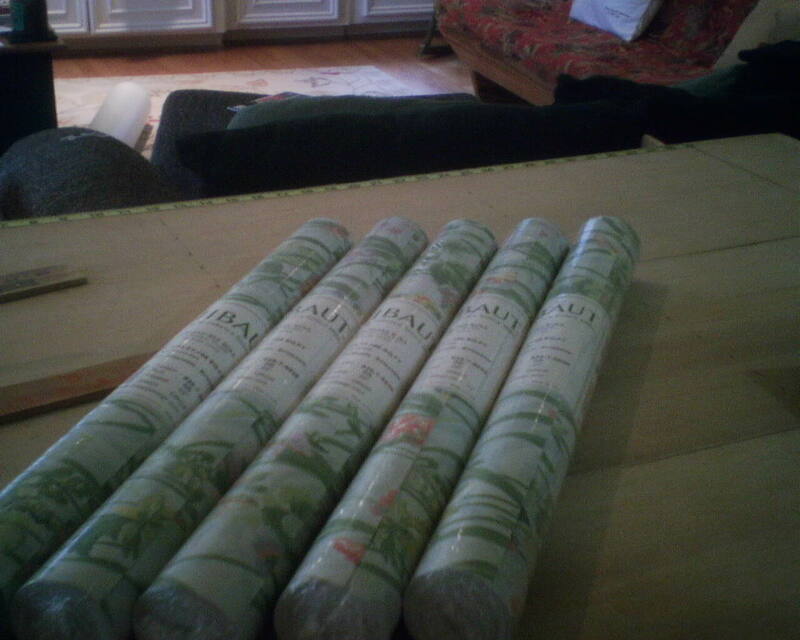 age, heat, and humidity. 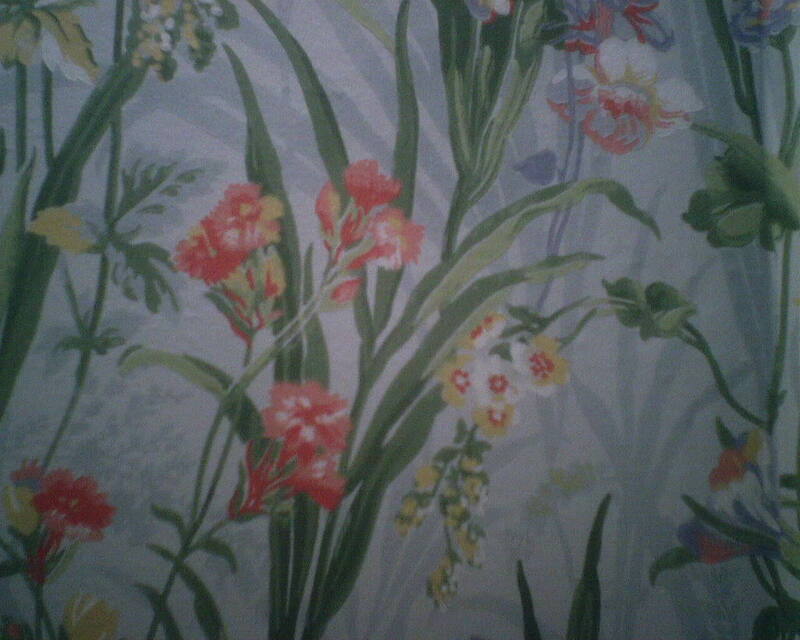 The pattern, however, was not too dissimilar to this one, being a sort of “impressionistic painting” design in the same blue, pink, yellow, and green color scheme. 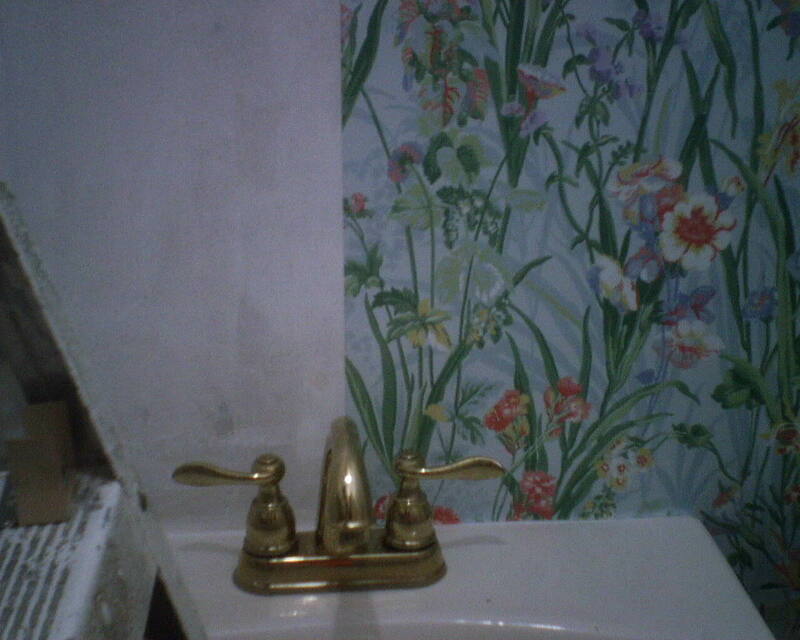 Anyway, the new powder room looks fantastic. 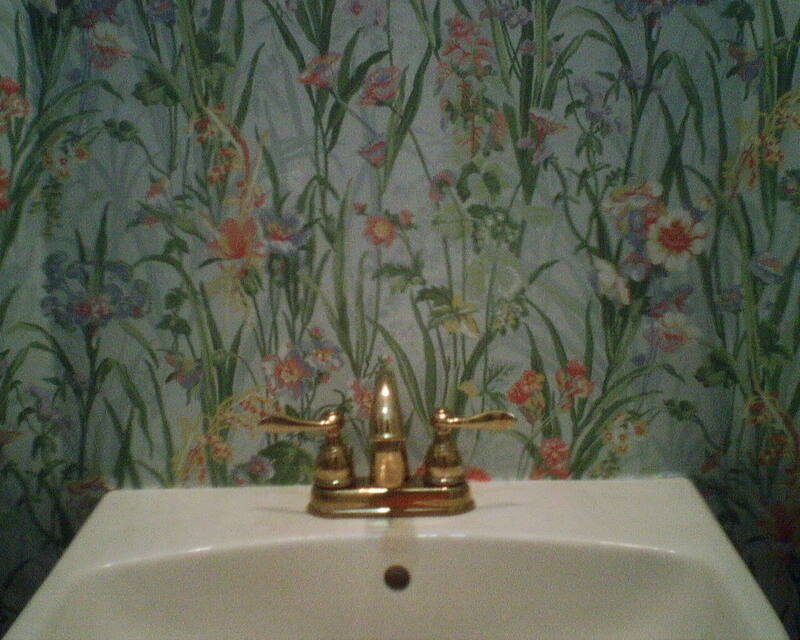 The colors are similar to what the homeowner had before, but this wallpaper should hold up much better. 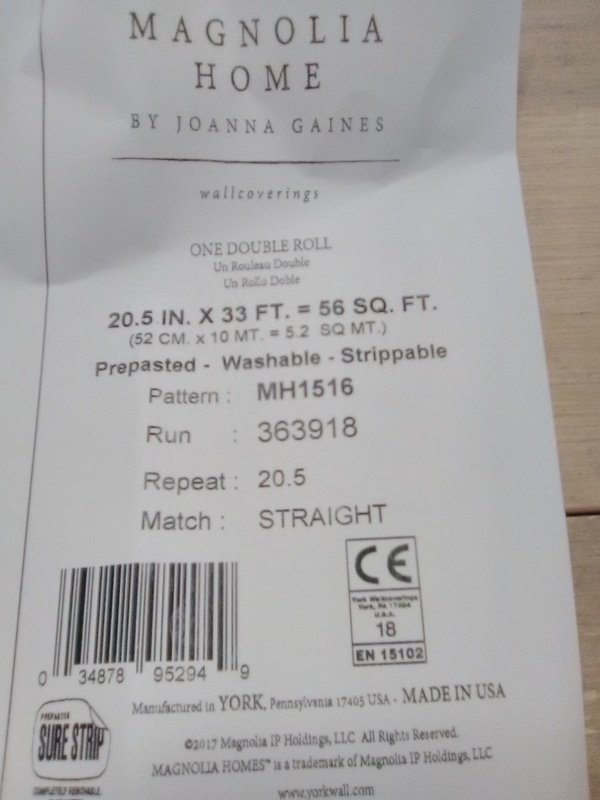 The material is paper (not vinyl), and will hug the wall tightly. 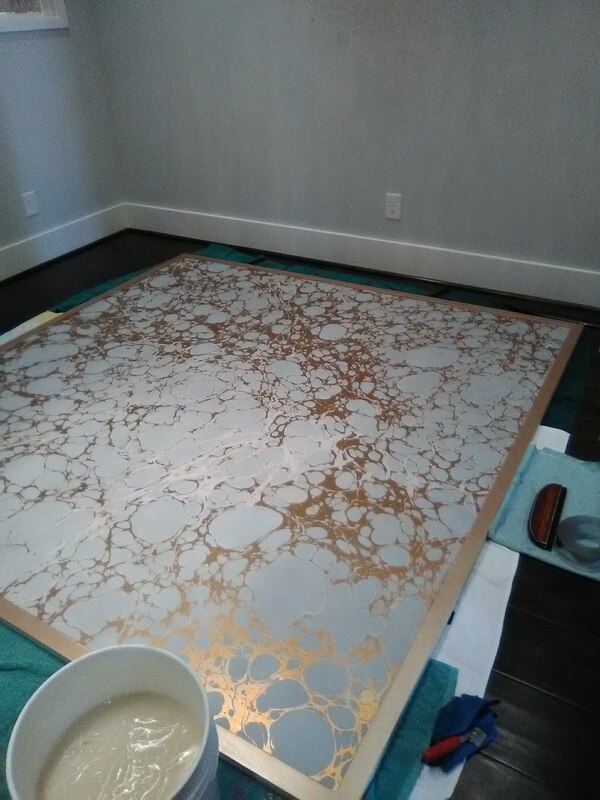 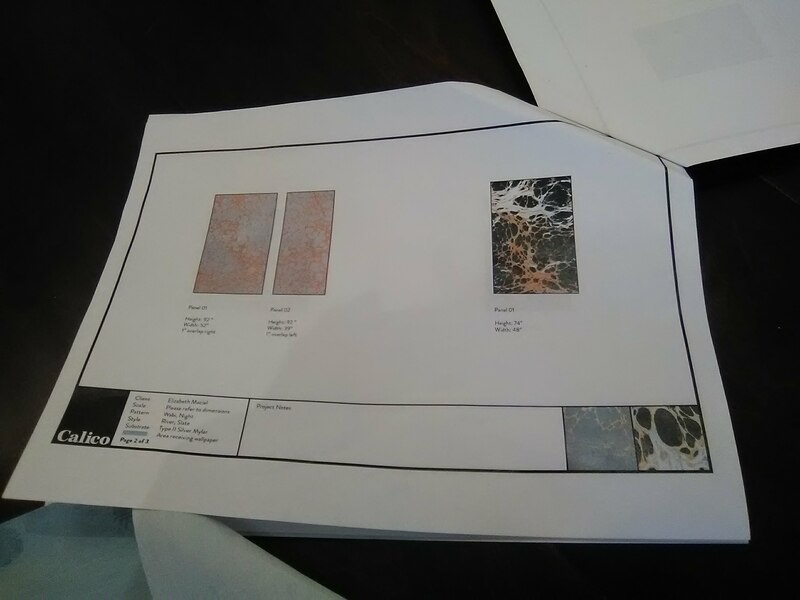 I removed every scrap of old paper and sealed the walls with a penetrating sealer named Gardz, and then primed with a wallpaper-specific primer called Roman’s Ultra Prime Pro 977. 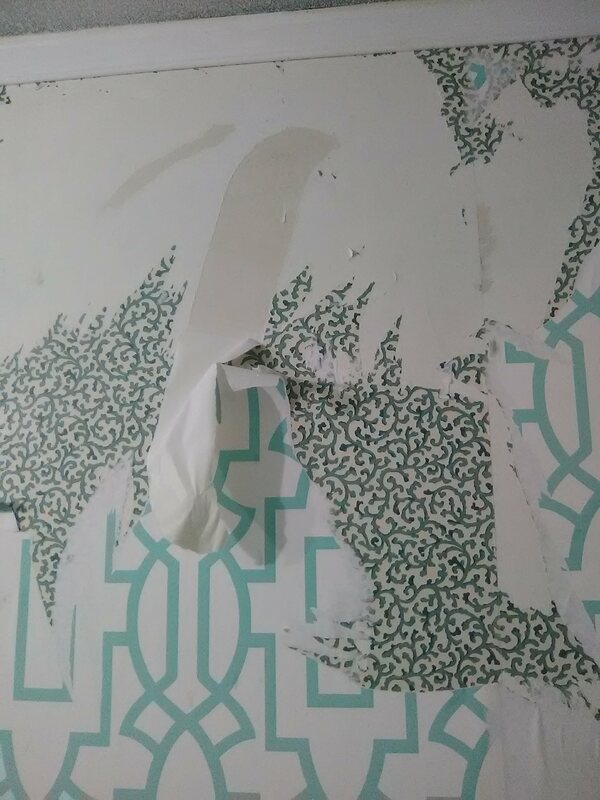 On top of this good foundation, the new wallpaper is a pre-pasted, raised-ink paper by Thibaut, and is one of my favorite products to work with, and I also love it’s dependable performance down the road. 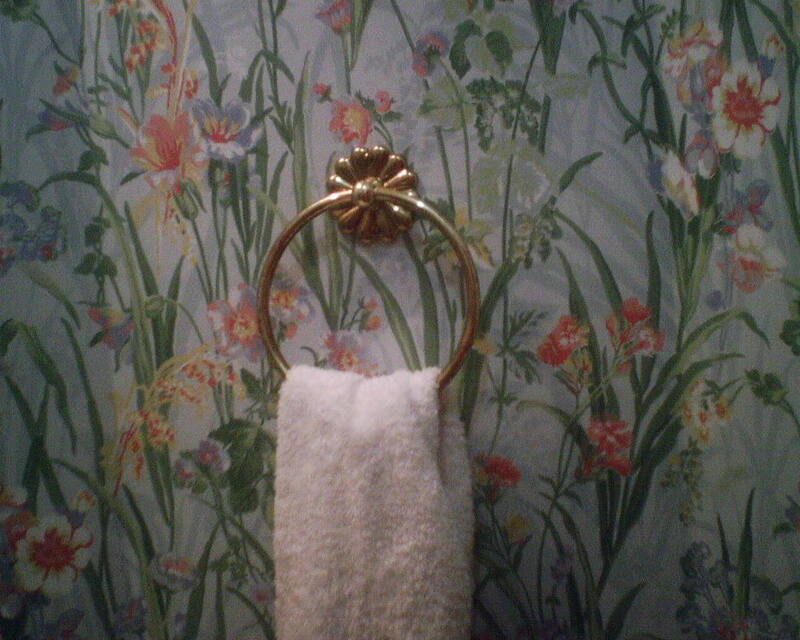 The pattern is #6936, and is very similar to their “Augustine” hummingbird design (Do a Search here). 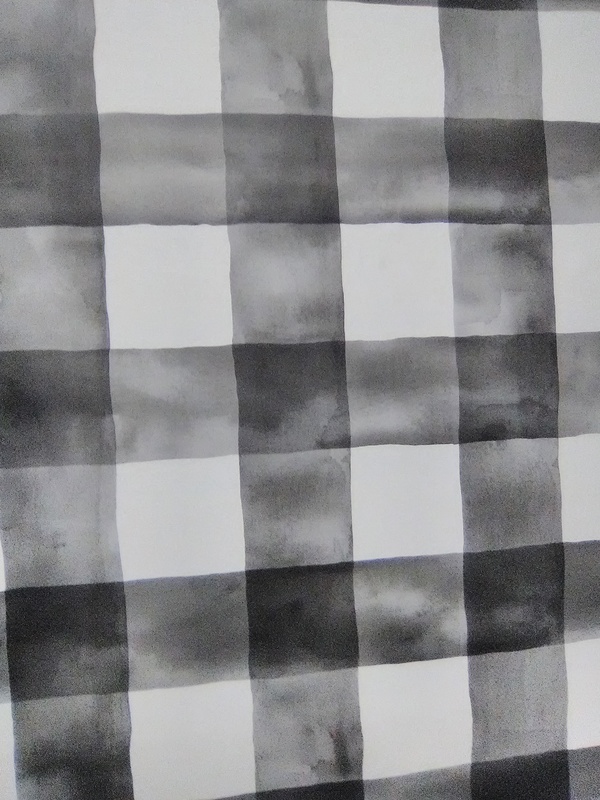 I love the barely-discernible texture of these raised-ink papers. 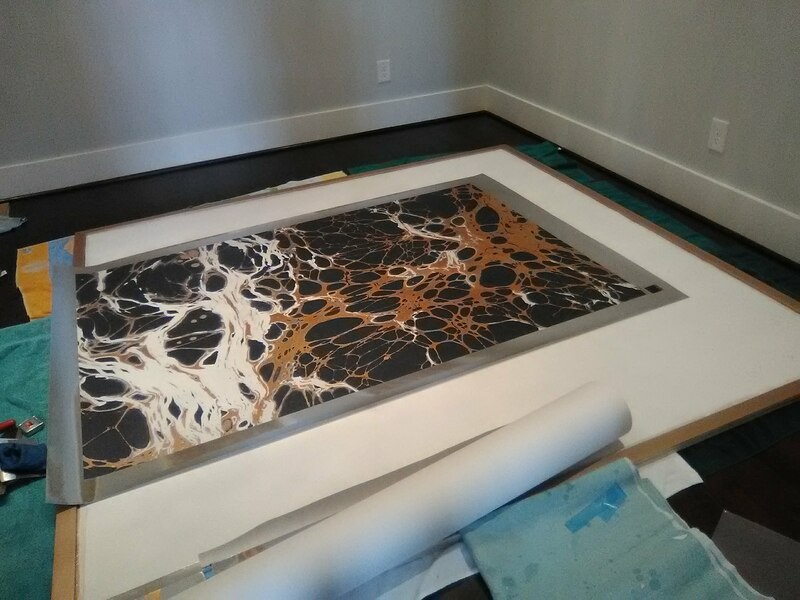 A unique printing process results in this effect. 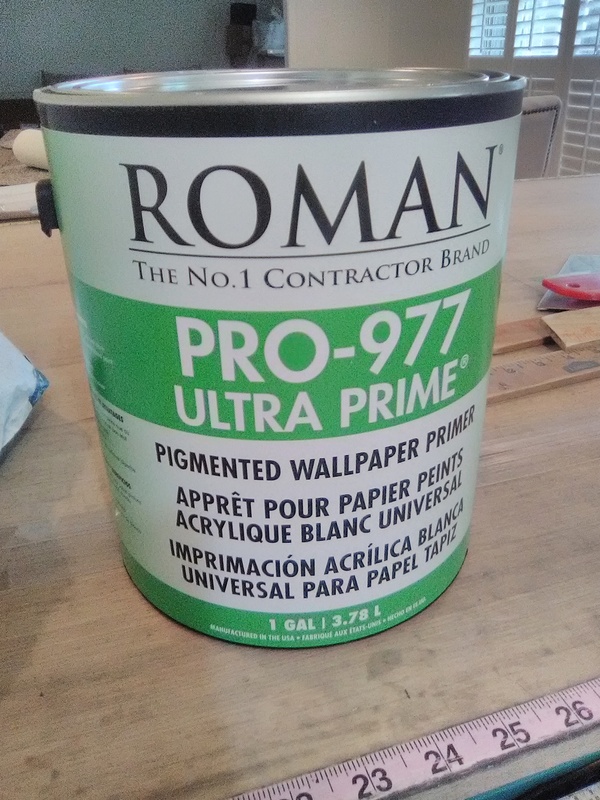 Ultra Prime Pro 977 is a quick-drying, pigmented wallpaper-specific primer that is about my favorite for hanging on when the conditions are right for it. 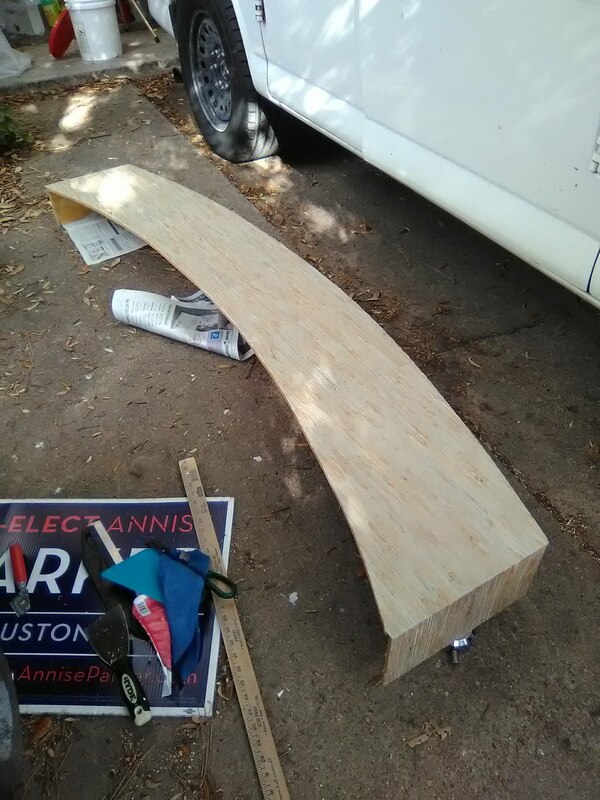 It is rolled on and cut in at the edges with brush, just like paint. 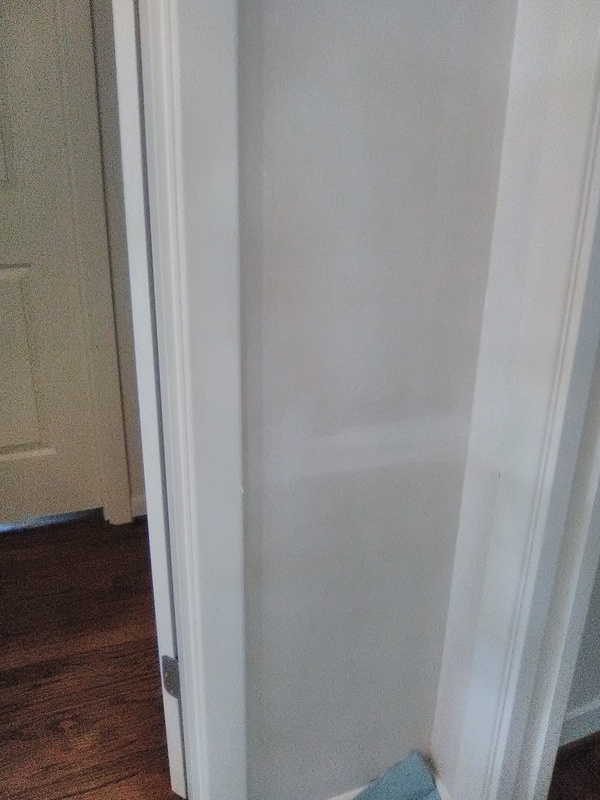 I didn’t get a “before” shot, but this entry hall in a West Houston home was originally papered in a beautiful, but very dark, red wallpaper. 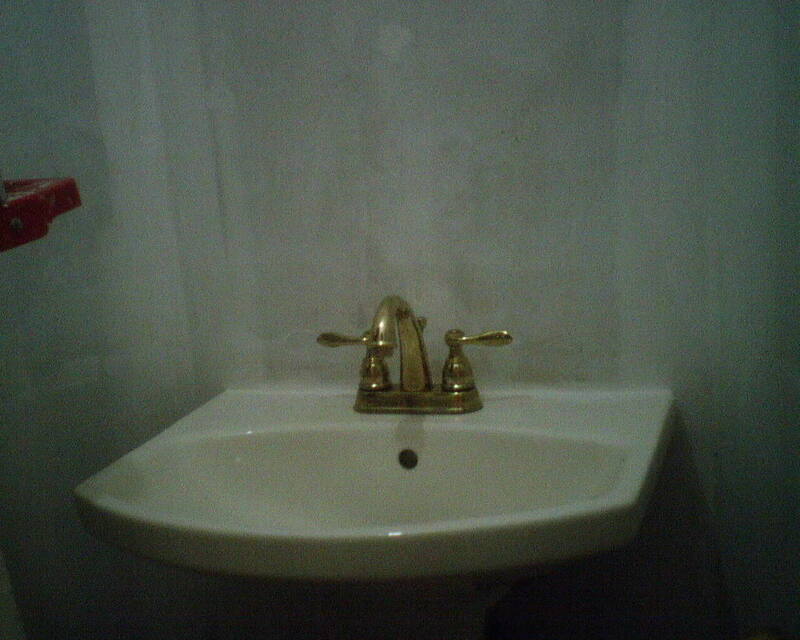 There was nothing wrong with it, but it didn’t suit the taste of the new owners, a young family. 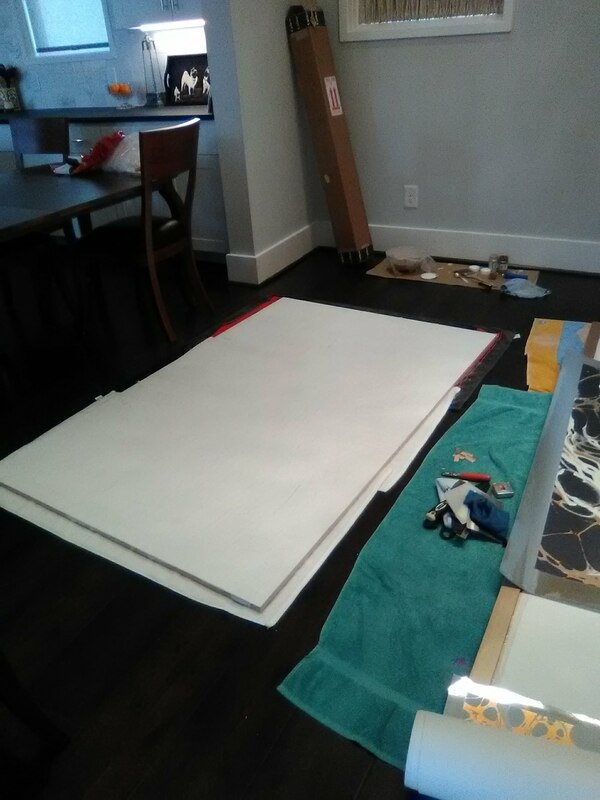 In the first photo, the dark walls have been sealed with Gardz, then primed with a coat of white-pigmented Ultra Prime. 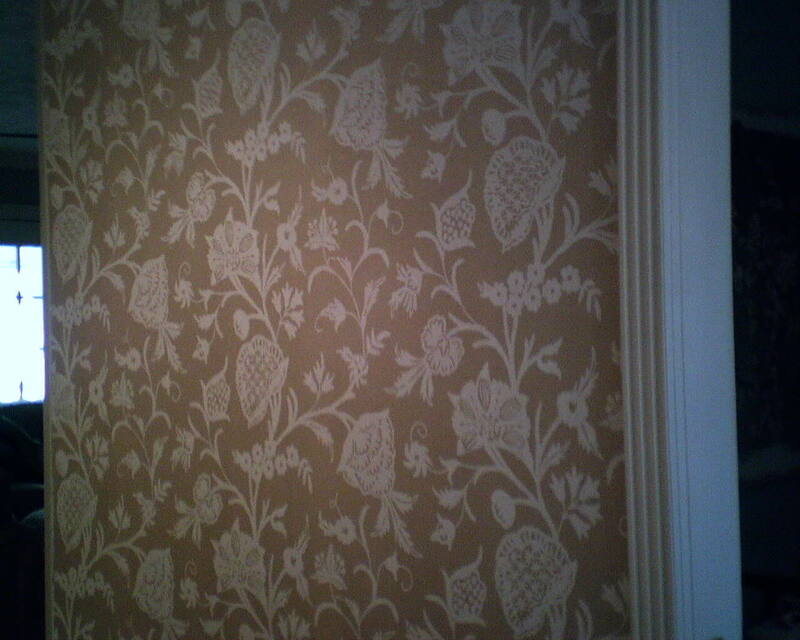 In the second photo, the new, golden and shimmery wallpaper with a traditional floral pattern has gone up. 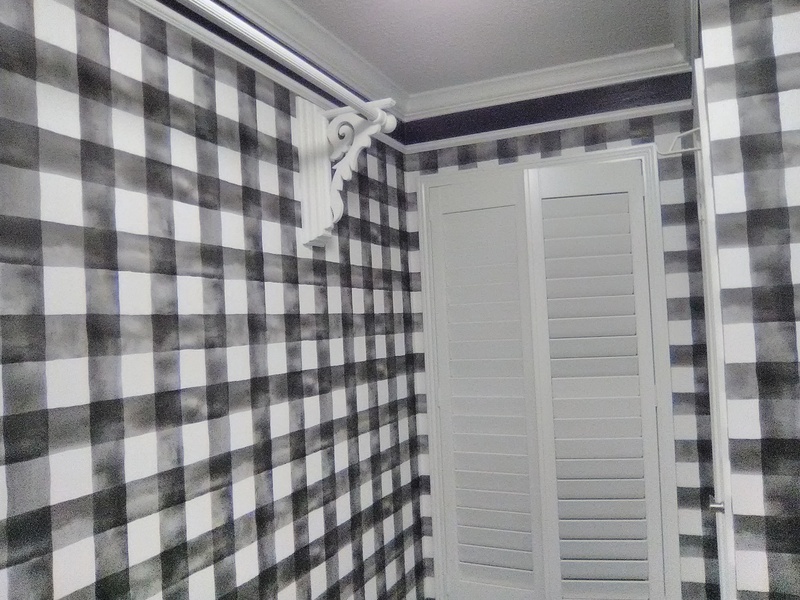 All I can say is, this really transforms the room!